Andrew Dewar was born in Toronto, Ontario, and graduated from Ryerson Polytechnic Institute (B.A. Journalism) and University of Toronto (M.A. Japanese Studies, Library and Information Science) before moving to Japan in 1988. After completing his doctoral studies in library science at Keio University, he joined the faculty of a junior college in Japan. Soon after arriving in Japan he rediscovered his childhood love of designing and flying paper airplanes. His passion for paper airplanes led him to become president of the Fukushima Paper Airplane Club. 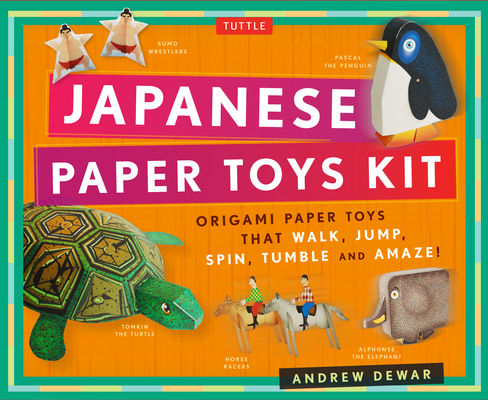 Dewar has published over 30 paper crafting books and kits. He also teaches paper airplane workshops and does seminars at schools, libraries, community centers and museums. He lived and taught library science in Fukushima, Japan, until the giant earthquake and nuclear accident in March 2011, when the city became unsafe. After a brief stay in Canada, he's returned with his family to Gifu, Japan. Kostya Vints was born and raised in Minsk, Belarus. In 1995 he received his Master degree in Product Design at Belorussian Polytechnic Academy (Minsk, Belarus). After moving to Los Angeles in 1997, he continued to pursue his career as a graphic artist and in 2002 Kostya graduated from Westwood College of Technology with an Associate degree in Graphic Design and Multimedia. He has been creating digital art for over 13 years. Kostya has produced illustrations and conceptual art for a diverse array of companies and publications worldwide.